No ad breaks, declares Fox Sports of its coverage of the Boxing Day cricket test in Melbourne. Well none, if you don’t count the scoreboard endorsements, perimeter branding and other in-game adverts promoting one brand or another. All of them impossible to miss. Also noticeable among them was the preponderance of betting, junk food and alcohol advertisements. 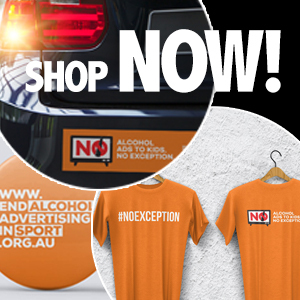 Last October, when the End Alcohol Advertising in Sport campaign was launched, the Foundation for Alcohol Research and Education (FARE) released a report on the prevalence of alcohol ads during the football grand finals. It found advertisements appeared at the rate of just under one per minute for the AFL and more than three per minute for the NRL. These games were mostly played during children’s viewing times. All Test cricket is played during children’s viewing times. The Boxing Day test was also notable for the interviews with Cameron Bancroft and former Australian captain Steve Smith about the notorious sandpaper ball-tampering affair. Adam Gilchrist’s interviews were compelling viewing – not for revealing anything new, but rather for exposing the massive moral and ethical failures on the part of all three players and Australia’s cricket administrators. Remember, the cheating followed Cricket Australia’s James Sutherland’s reported censure of the players after a fifth straight loss: “We don’t pay you to play, we pay you to win”. 2018 has been a year of stunning moral failures. In politics the year was bookended by Barnaby Joyce and Andrew Broad, one of whom still finds it near-impossible to see the problem. In between, the government completely lost the plot – assassinating a Prime Minister, bullying female MPs and finding it nigh on impossible to make any concession to its tough border protection policies. Abuse of public policy, extortion of taxpayer dollars and craven political self-interest has shattered public trust in Australia’s democracy. It was little better down at the ABC as a politically-stacked board wavered under unrelenting attacks from the right-wing political establishment and certain media interests, sacking its Chief Executive and attempting to engineer the sacking of senior journalist Emma Alberici. The banking royal commission utterly exposed the complete and repeated ethical failure of Australia’s banking elite – both directors and senior management. Other industry sectors are unlikely to fare any better if subjected to similar scrutiny. Let’s see how the building and construction industry is travelling once investigations into Australia’s system of building certification gets under way, following the frightening scenes at the Opal Tower in western Sydney over Christmas. At the heart of these massive failures are profits and property rights repeatedly being placed ahead of the public interest; senior officials and captains of industry are ethically compromised by opaque corporate objectives, poor value sets and the pursuit of personal enrichment. This – perhaps – explains why our major sports seem perplexed by public health, community and political efforts to bring to an end alcohol, gambling and junk food advertising and sponsorships of football, cricket, tennis and motor sport. It is deeply frustrating that these sports absolutely refuse to countenance any dialogue about ending these business practices while nine in ten Australians say they want them stopped. “These are legal products,” they cry. “Our development programs will be compromised. Players will leave the game. The sky will fall in.” No it won’t. This is tainted money – it comes with a price that goes to the heart of these sports’ values sets. Witness the NRL where recent and serious incidents of domestic violence, misbehaviour and general abhorrent behaviour by players are linked to alcohol. Yet despite repeated calls for the league to end its alcohol brand associations, notably by Fairfax columnist Peter Fitzsimmons, the NRL remains unmoved. Cricket is little different. Questionable ethical behaviour, manifested so spectacularly in South Africa last March, has been a persistent problem. No doubt the personal and collective failings of too many people and too many organisations over the past year will be repeated to some extent in the new year. Parents are painfully aware of how their behaviour (good and bad) affects that of their children. Sports should be too, and their leadership and their players need to understand how poor behaviour is linked to ethical standards and try to do better. Legislating standards of ethical behaviour only works to an extent. Ultimately the best standards are those one sets oneself. In the sporting world, constant vigilance is required to combat the corrupting influence of money and power. If sports administrators would think for moment about how their decisions – seen through an ethical frame – shape and influence the behaviour of players, fans and children, then they would see how irresponsible it is for them to continue associations with booze, gambling and junk food brands. Failure to do so would suggest they haven’t been paying attention. The lessons of the past 12 months should be clear to all. Strive to achieve higher standards, particularly when it comes to behaviour; show some leadership; and have the courage to make a difference. For all our sakes – and particularly for our children – just do it! First published on John Menadue – Pearls and Irritations. So we’ll put and so true in all areas.Our society needs greater education on these matters which most seem to shove under the carpet or down their crickey pants!